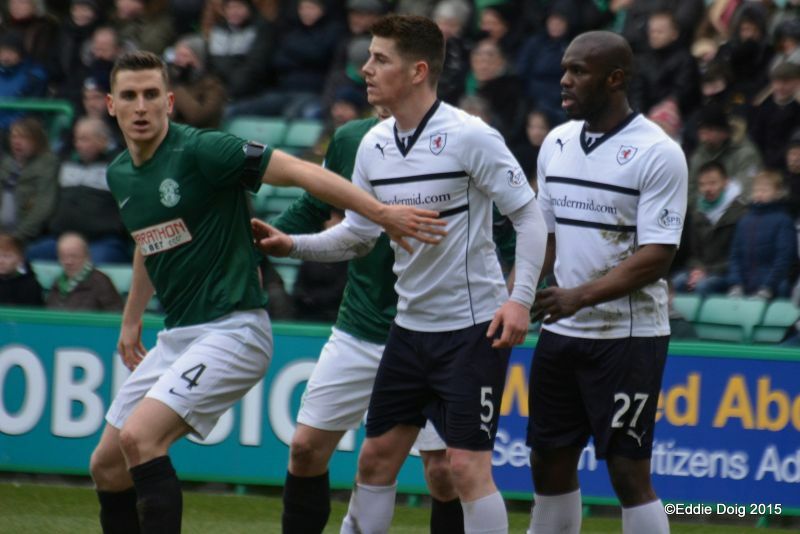 An injury-time Christian Nadé header stole a point for Raith after a dominant display from Hibernian at Easter Road, undermined for the home side by numerous missed chances and an inspired display from Raith keeper David McGurn. With the clock at 90 minutes, the muscular Nadé rose at the far post to nod home, sending the visiting Raith fans into euphoric celebration. 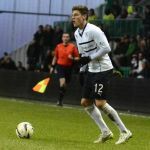 This was the archetypal smash-and-grab raid – Raith were second best for long spells, with Hibs’ fluency through midfield creating a host of shooting opportunities for a mobile and effective front-line. 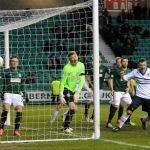 While Raith will be jubilant returning to Starks Park with a point, Hibernian players and fans alike will reflect on two halves of profligacy in front of goal, and a squandered opportunity to make the symbolic step above Rangers in this season’s Scottish Championship. With Raith unbeaten in four games, it was perhaps surprising that manager Murray made several changes to last week’s starting eleven. Scott and Conroy were relegated to the bench – Grant Anderson and Barrie McKay starting wide, with Ross Callachan partnered by Kevin Moon in the centre, the former Livingston man returning for his first start since early December. Media interest before the match centred on Hearts’ loanee Dale Carrick – the impressive young striker joining the Starks Park side on a month’s emergency loan this week. Carrick, wearing number 18, started on the bench. 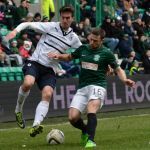 For Hibs, an impressive recent run was reflected in a consistent starting selection from Alan Stubbs. 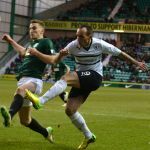 Callum Booth, who joined Premiership Patrick Thistle mid-week, was the only change – Keith Watson starting in Booth’s former right-back berth. Boyle and Cummings started upfront, assisted by a vibrant midfield of Scott Allan, Dylan McGeouch, and Liam Craig. 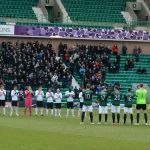 With grey skies above, and the grey waters of the Firth of Forth visible between the Easter Road stands, the match started with a warming gesture – a minute’s applause for former Hibernian chairman Douglas Cromb, who passed away recently. 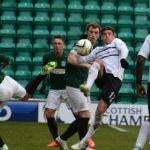 The first half began with Nadé and Stewart alternating as Raith’s furthest forward, with Hibernian largely dominating the half-way line. Callachan and Moon scurried around the midfield, snapping at heels and covering expanses of the central third, but Hibs’ short pass-and-move game frequently created space to turn for mobile front-men Boyle and Cummings. In the opening ten minutes, a Boyle shot was deflected wide for a corner, a weak Fontaine header was collected by McGurn, and a stinging drive from Cummings flew straight into the chest of the Raith keeper. 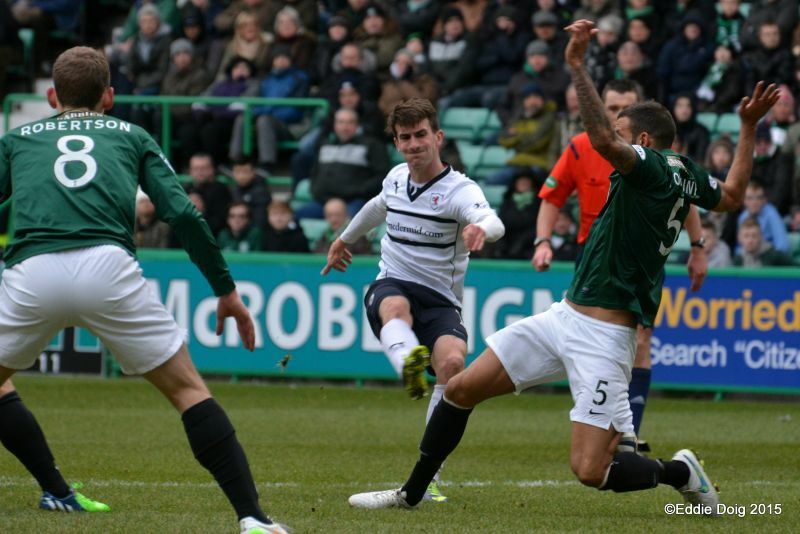 A run and shot from Grant Anderson was Raith’s only foray of note into the Hibs half in the opening half-hour. 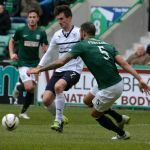 Up front for Hibernian, Jason Cummings regularly found space in front of Watson and Hill, and was alert enough to play in team-mates once Raith defenders were drawn to him. Scott Allan was given space to shoot, his rasping drive zipping over McGurn’s bar. 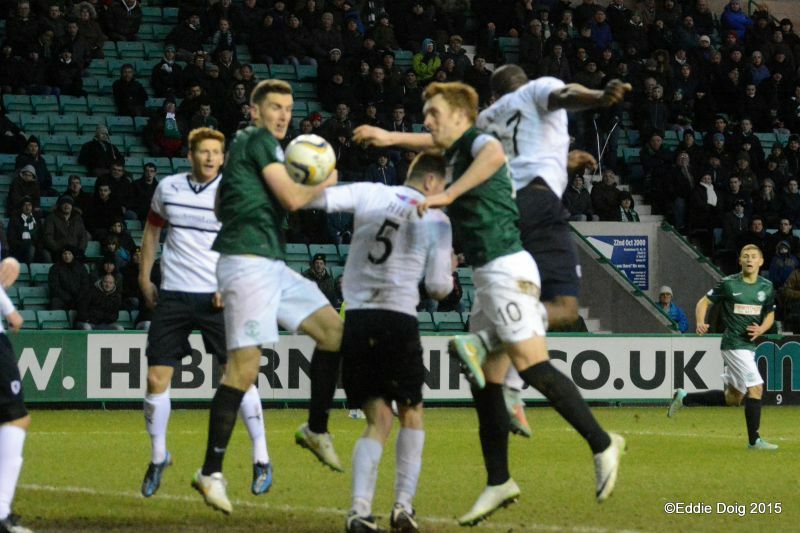 In the midst of Hibs’ early pressure, a loose pass was seized on by McKay who released Nadé on the half-way line. 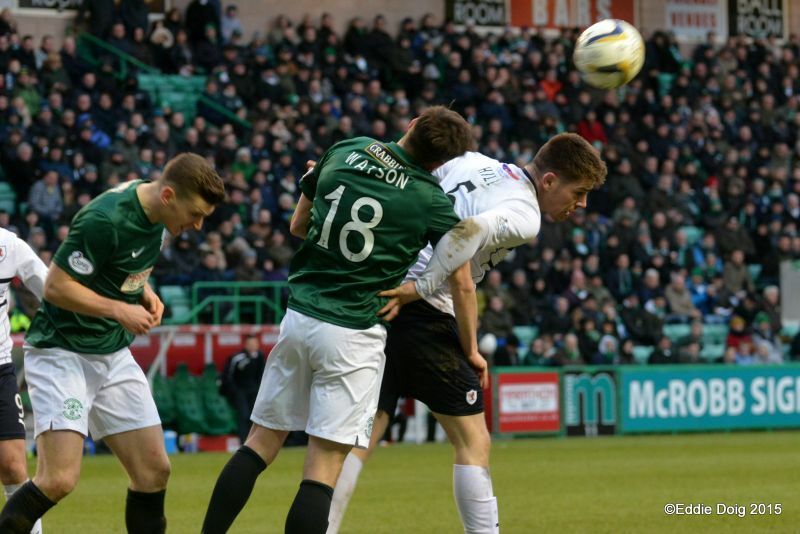 Hanlon’s agricultural challenge drew the first yellow card from referee Anderson. 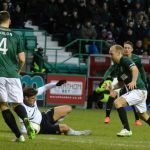 Raith seemed content to allow Hibernian to press from half-way, with McKay and Anderson on both wings tucking in to create a narrow central channel – however the home side repeatedly breached the barricades erected by the visitors. With quarter of an hour gone, McGeouch twisted and turned, flicking a lovely ball behind McKeown inviting debutant Keith Watson to cross, his namesake Raith’s Paul Watson stretching to nod clear. 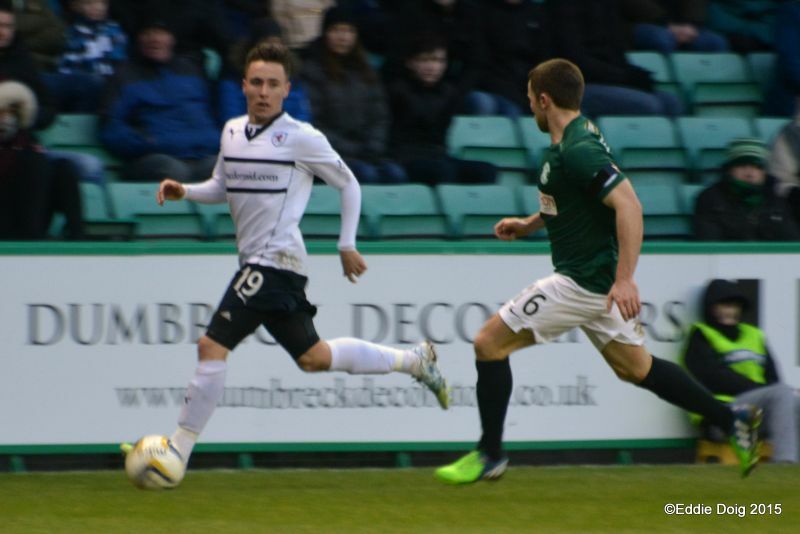 A drive from Scott Allan was blocked away, as Hill and Watson looked increasingly pressured at the heart of Raith’s defence. Following a rash Callachan challenge in midfield, a driven free-kick from a central position tempted McGurn to venture from his line – luckily for the Raith keeper, Fontaine’s header drifted beyond the far post. 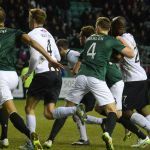 Although not booked on that occasion, Callachan was soon in the referee’s notebook for a trip as Hibs tightened their stranglehold in midfield. 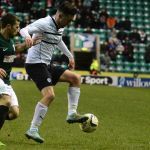 Again with time to cross, Keith Watson drove a glorious ball across the Raith six-yard box in the twenty-fourth minute – Boyle was perhaps surprised by the pace on the ball, and was unable to do justice to the quality of the invitation. 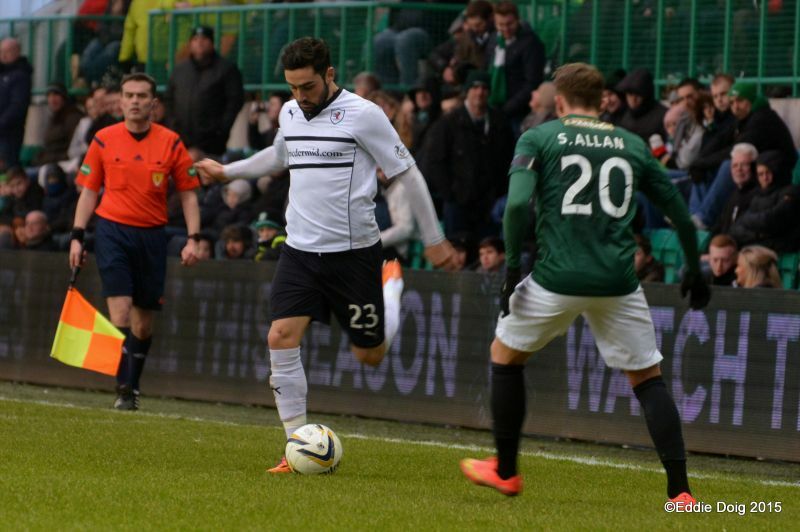 Raith had a real let-off just after the half-hour. Moments after Allan had delayed a shot on goal allowing McKeown to block and a Fontaine header had fizzed wide, Cummings dropped off Hill, twisted on the edge of the box, and fired sharply across McGurn – the ball struck the base of the far-post and rebounded to safety. As half-time approached, McGurn was again called into action with a point-blank save from Boyle and diving to his right to deal with Cummings’ drive from distance. 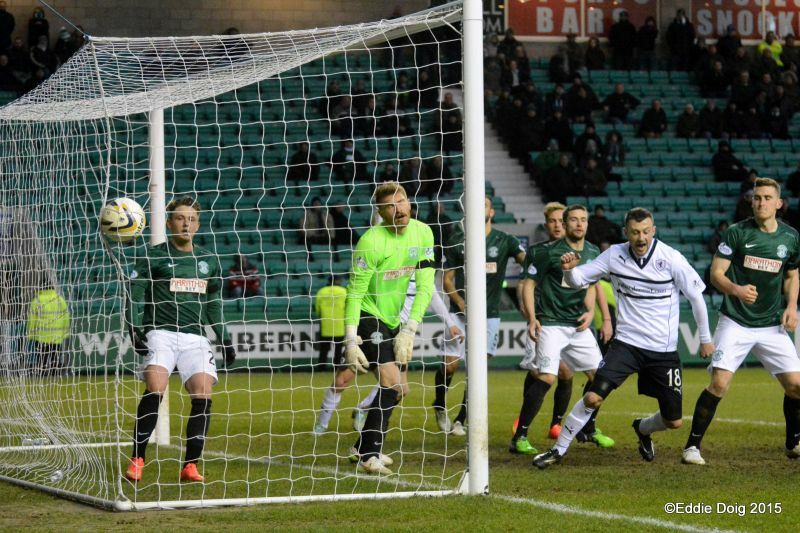 If Raith could count themselves lucky to reach the safety of half-time still level, a moment of quality from Dylan McGeouch tore up Grant Murray’s team-talk within moments of the restart. With Allan and Cummings both looking lively, McGeouch threaded a delightful ball outside Watson and into Boyle’s path. 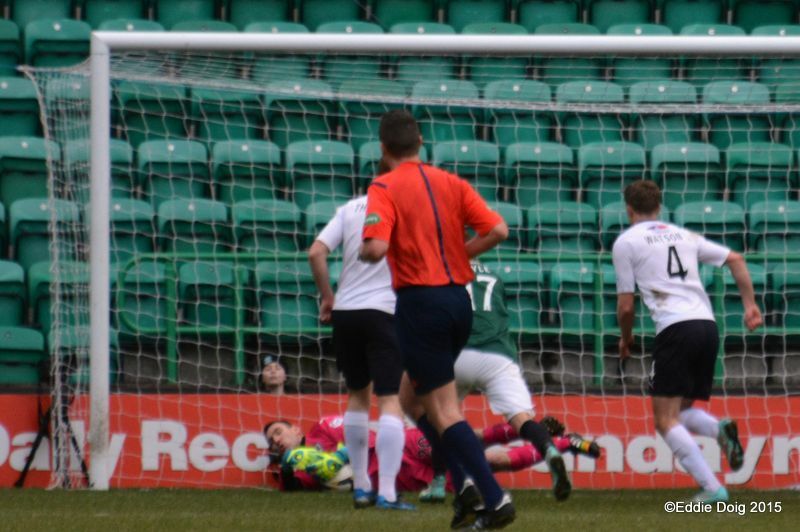 With McGurn advancing, Boyle showed good composure to sweep his finish beyond the Raith keeper. Raith suffered a torrid spell for the following quarter of an hour. Chance after chance came and went with McGurn, Watson, and Hill each making key interventions matched by some sloppy finishing from the hosts. 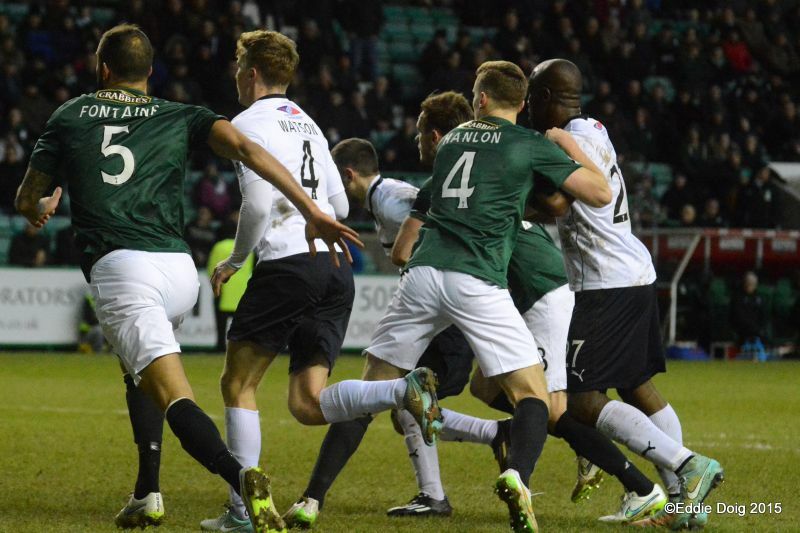 Although Stewart shot at Oxley’s near-post soon after Hibs’ opening goal, the second-half traffic was largely one-way in the direction of Raith’s goal. Scott Allan burst through midfield and side-stepped Moon, allowing Cummings to shoot straight at McGurn. 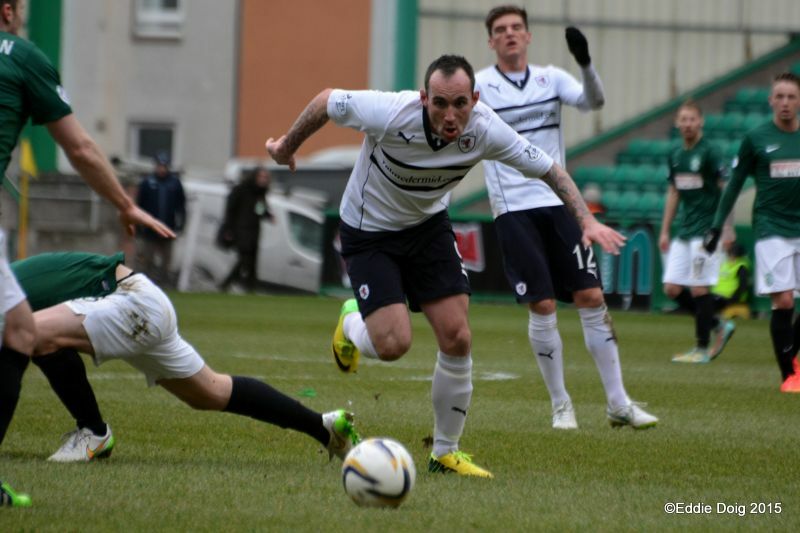 Stevenson and Boyle combined to free Cummings again moments later, with again McGurn coming to Raith’s rescue. 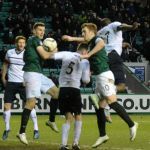 Hibs’ best chance of their dominating spell after taking the lead saw Fontaine surge out from defence with Cummings firing straight at McGurn from close range, Boyle’s rebound was deflected onto the bar, allowing a backs-to-the-wall rear-guard action from Watson to bundle the ball to safety. Boyle held his head, knowing another chance to seal a victory had gone begging. Shortly after, Liam Craig had a drive from distance tipped over acrobatically by a flying McGurn. Although Raith had steadied the ship after the hour mark, it was still the home side who were pressing more effectively and looked by far the more likely to score. 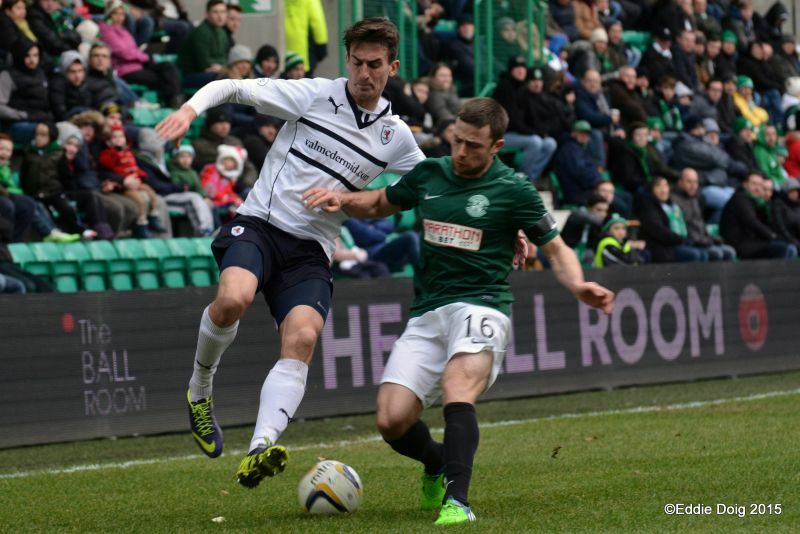 Grant Murray will have noted with dismay the ease with which Hibs were able to build through midfield. 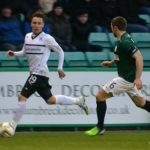 With a deceptively languid style, Scott Allan was able to pick numerous incisive passes all afternoon; his willing runners Craig and McGeouch constantly gave Raith’s two-man central pairing of Callachan and Moon cause for concern. 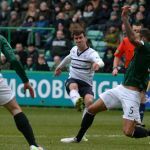 Raith fans got their first glimpse of Dale Carrick with twenty minutes remaining – Murray withdrawing a tiring Stewart and Grant Anderson, and bringing on Ryan Conroy as well as debutant striker. 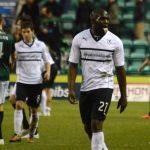 For his opening minutes in his new colours, Raith’s new striker hustled and bustled behind Nadé and gave a new impetus to Raith’s efforts. The home side had the ball in the net on 72 minutes – Cummings’ shot from twenty yards was blocked well by McGurn. Boyle bundled the ball home, but was adjudged off-side when the initial shot was struck. The home support howled in anguish, sensing perhaps that the match was still in the balance, despite the number of quality chances their side had created. Fontaine side-footed wide of McGurn’s post from a corner a minute later, increasing the gathering sense of anxiety within the home support. 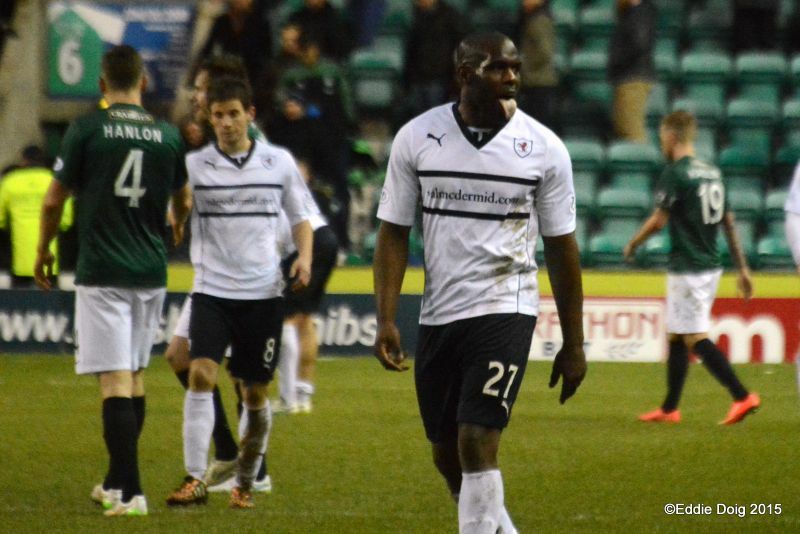 Despite having been under the cosh for so long, Raith gathered themselves in the closing stages. 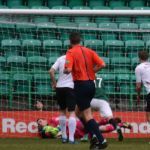 Urged on from the touchline by a management team sensing a point was still within reach, for the first time the visitors created some kind of ascendancy. Carrick and McKay escaped through the centre, for the first time making Fontaine and Hanlon look vulnerable in the depths of the Easter Road rear-guard; a Callachan cross aimed at Nadé was scrambled clear; and from a deep McGurn clearance, Nadé grappled his way beyond a retreating Watson forcing Oxley to charge from his line to clear. With moments to go, Carrick pulled wide, committed his man, and won a corner. 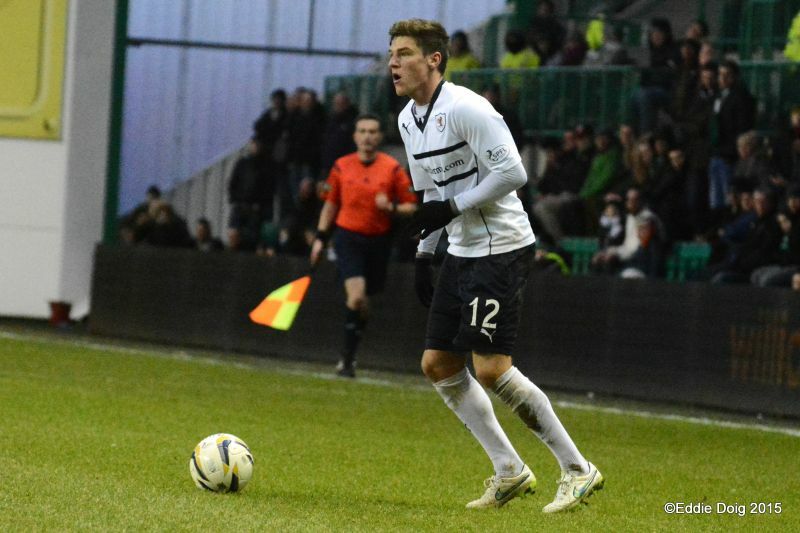 Conroy, in front of the vocal Raith support, floated an inviting cross through the Hibernian six-yard box. 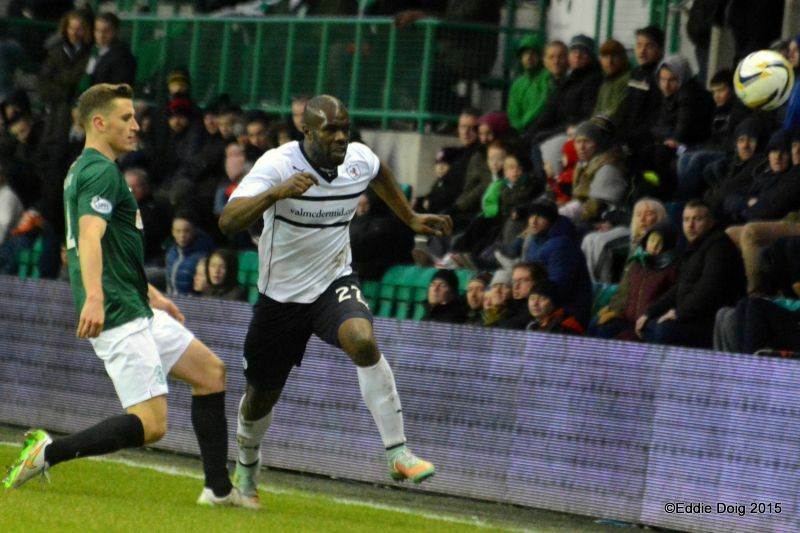 With Oxley hesitating, Nadé rose to punish profligate Hibs and claim an unlikely equaliser. Cue bedlam in the away support, and a mass exodus from the Easter Road faithful. 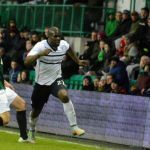 For the second time this season, Grant Murray’s men claimed a point at Easter Road; and for the second time, Hibs perhaps merited all three points over the ninety minutes. As Raith’s unbeaten run extends to five games, today’s draw will undoubtedly feel like a victory within the Raith camp – perfect preparation for next weekend’s cup visit to Ibrox. Welcome to Easter Road, the skies are clear and it's a crisp 3 degrees. 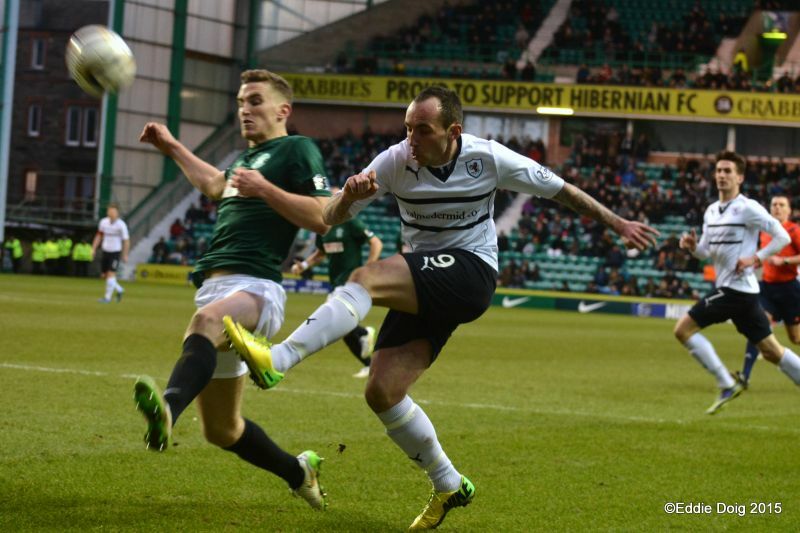 Hibs have one change from last week, Callum Booth who is on loan to Partick makes way for Keith Watson. 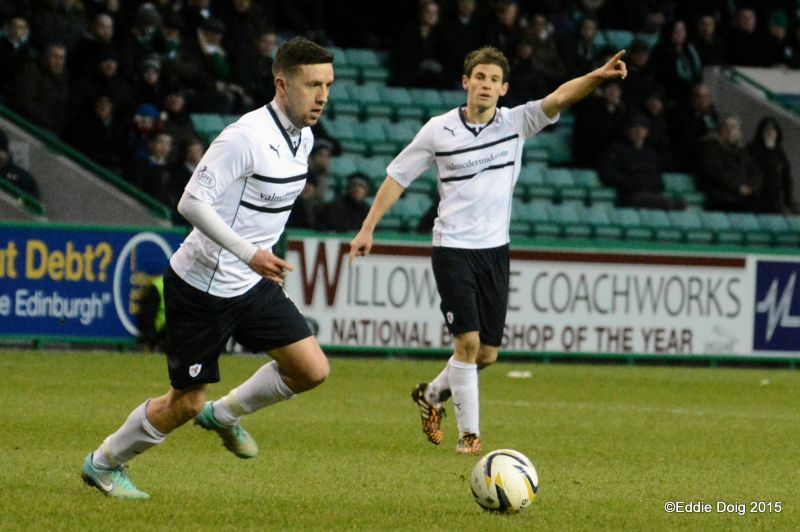 Raith Rovers make two changes, Scott and Conroy drop to the bench in favour of Moon and McKay. On loan Dale Carrick is on the bench and is assigned the number 18 shirt. Over a hundred or so away supporters braving the cold. Rovers in white kick off towards the Famous Five stand. 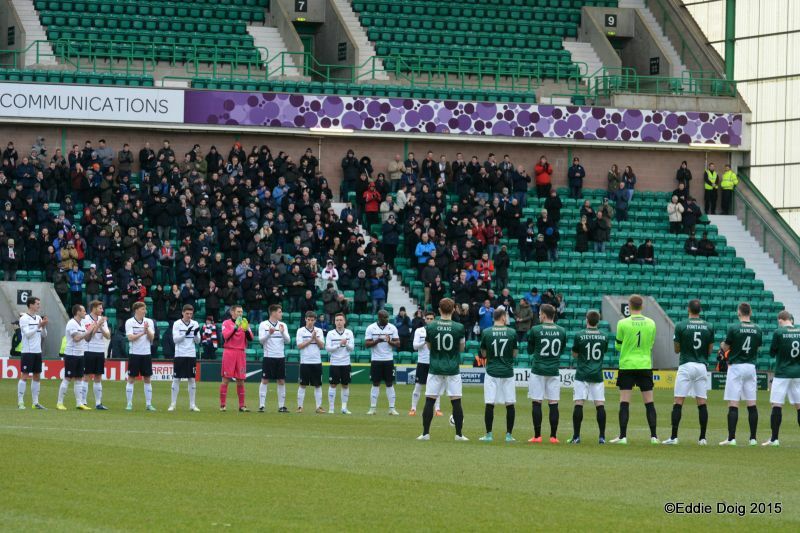 Before kick off a minutes applause was observed in honour of the recently deceased Douglas Cromb. Boyle shoots and the ball is deflected off Watson for a corner. 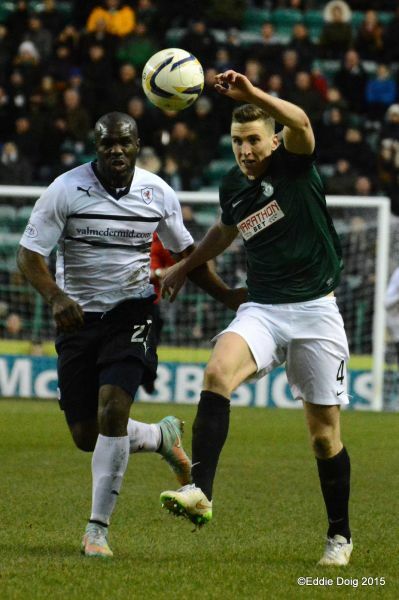 Ex Jambo Nade receiving a warm welcome from the Hibees. Cummings caught out when a crossed ball accidentally glanced off his head and into the arms of McGurn. Stewart goes on a run down the left and is eventually intercepted by Hanlon. Allan with a close range shot which is blocked by Watson. Number 20 Allan again this time from 25 yards shoots over the bar. Hanlon yellow for scything down Nade. Watson improvising, this time using his backside to block from Allan. 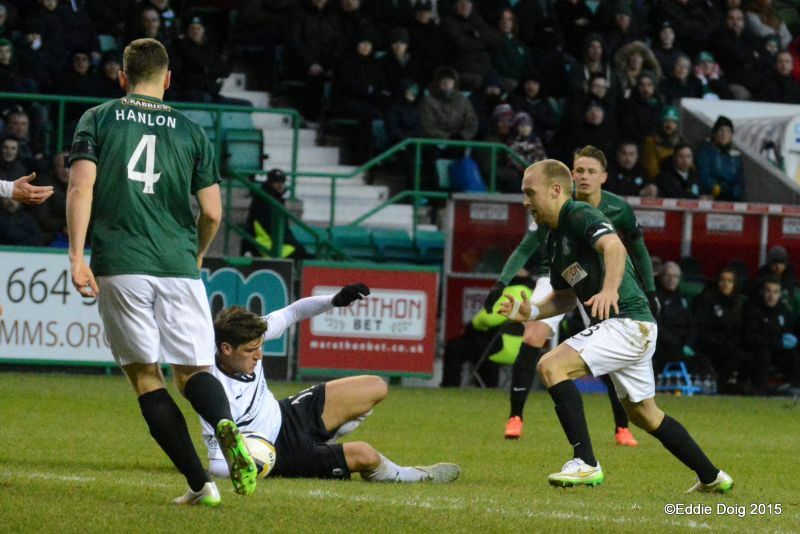 McKay loosing the ball in the Hibs half has to run the length o the park to recover the ball. The ref has a word with Callachan after a coming together with Robertson. Keith Watson taking too much time teeing up his shot sees it blocked by McKeowan. Rovers forays up the park are very few. 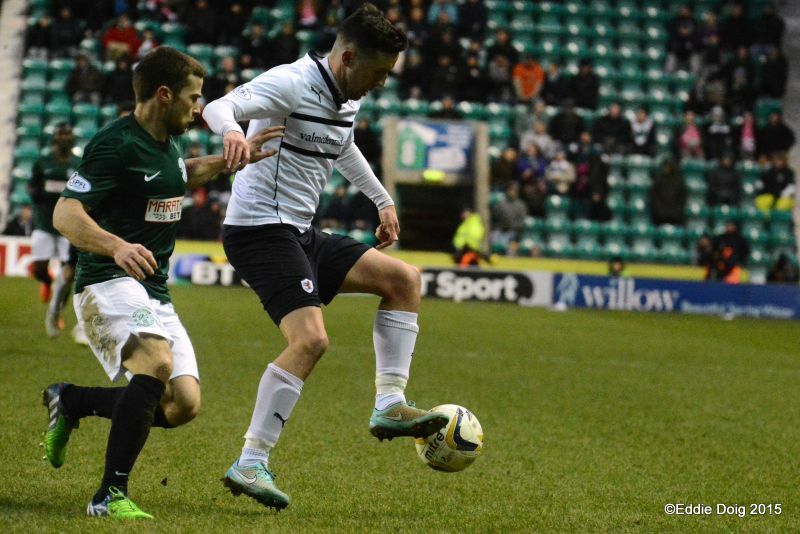 Raith making headway down the rights, Thomson gets a cross in, it fell to Moon but he scuffs a pass out to Stewart. Craig unlucky as his glancing header goes wide. Raith riding their luck, Craig shooting from 25 yards hits McGurn's left stick. Rovers stroking the ball about trying to find an opening. McKay strikes just inside the box, the ball is deflected off Hanlon. Thomson is out of puff running back to block from Allan. Rovers hoping to weather the storm until half time. Liam Craig side foots the ball just wide of McGurn's left post. It's getting colder, let's hope the fare on the pitch warms us up. 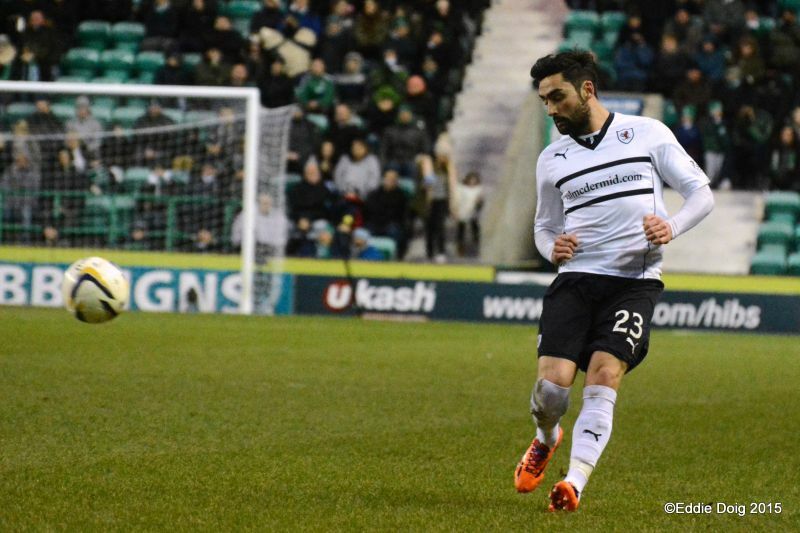 Martin Boyle breaks free and slots a diagonal ball past McGurn. Goal Hibs. Stewart forcing a finger tip save from Oxley. Stewart tried to shoot high at Oxley's near post. McGurn the saviour, blocking from Cummings. McKeown taking a knock, fouled by Cummings. Cummings shot is blocked by McGurn, the rebound fell to Boyle who fired the ball off the underside of the bar and the ball going clear. Stewart and Nade not getting any deliveries. A wee spell of head tennis going on. Anderson yellow for a late challenge. Allan taking the free kick tee's up Craig whose shot is tipped over the bar by McGurn. Stevenson yellow for a trip on McKay. Stewart through but his shot turned into a cross. Anderson and Stewart off, Carrick and Conroy on. Boyle has the ball in the net but is ruled offside. Cummings off, Dja Djedje on. Carrick with his first touch of the ball runs down the right but is impeded. Fontaine side foots a corner wide of target. Boyle tries to side foot the ball past McGurn but Davie blocks and Thomson clears. Rovers best move of the game sees players up in numbers but Hibs stand fast. Callachan whips the b all into Nade but is intercepted by Fontaine. Oxley had to earn his corn, coming together with the on rushing Nade. McGeouch off, Scott Martin on. Goooooooal Nade. Carrick won a corner, McKay crosses and the big man nods in at the back post. Goal Rovers. +2 Craig yellow for a foul on Nade. Oxley, Watson, Hanlon, Fontaine, Stevenson, Robertson, Craig, Stewart Allan, McGeouch, Boyle, Cummings. Subs, Cerny, Forster, Stanton, Handling, L Allan, Dja Djedje, Martin. McGurn, Thomson, Watson, Hill, Anderson, Moon, Stewart, Callachan, McKay, McKeowan, Nade. Subs, Cuthbert, Fox, Scott, Conroy, Vaughan, Carrick, Barr.